For a while, I tried to foist the blame for my cringing responses onto my mother. My then boyfriend (now husband) would mention a Christmas tree, and I would sigh and say we should wait another year. “It will just be so hard for her,” I’d say, imagining my mother’s expression if I told her we were getting a Christmas tree. As we approached our first Christmas as a married couple, and after my umpteenth tree-related excuse, my husband hit the nail on the head. “It’s just such a big symbol, ” I mumbled. I thought about the mezuzah on our door, the Shabbat candles we light on Friday evenings, the Hebrew phrases my husband has incorporated into his lexicon. Despite the boasting I do about our interfaith lifestyle, I really hadn’t had to do too much of the compromising yet. Victor’s honest exposure of my lingering resistance on the Christmas tree issue surfaced a real question: What does the Christmas tree symbolize to me that is so scary? I had embraced the actual meaning of the tree years ago. In Victor’s parents’ home, the Christmas tree is a glowing orb of familial warmth. Its aura and aroma reverberate through the whole house, filling it with light and the joy of the outdoors during the darkest month of the year. Nothing I’d felt in our six previous Christmases around their tree felt treasonous to my Judaism. So, what felt different about getting my own tree? The first feeling is simply that it is a tradition that doesn’t yet feel like my own. This, while it makes me feel a bit like a tourist in my own home, is a source of distance from the tradition, but not a source of my fear. I fear the look on my friends’ faces when the girl who spent Shabbat off-campus in college becomes a Jew with a tree. I fear my sisters–one married to an Israeli and the other to the son of a Holocaust survivor–and how they will describe my family’s choices to my nieces. I fear the ashen shame that will cross my mother’s face when she sees the tree in the background of a video call. It is a fear of selling out, of assimilating, of abandoning the dwindling tribe, a fear that was beaten into me as the cardinal sin in my Jewish education. The people we revere in Judaism are those who spun the dreidels in the fields to learn Torah at the risk of persecution, those who wouldn’t renounce their Judaism, even if it meant expulsion from Spain or being herded into death camps. We revile those who assimilated in Assyrian Greece–eating traif and forsaking their birthright in the Chosen nation. But, that’s not what I’m doing! My rational side screams to the childhood Day School student in my memory. Christmas to me is a practice of flourishing, a celebration of family and light in the darkness. Part of healing the historical wounds and preparing for the interfaith world we’re entering (whether we like it or not), is recrafting our story. We cannot make the future of Judaism a future based on fear. I choose a different narrative. I will tell my children that the Jews are a powerful people, a people of endurance and resilience, yes, but that they are also the people of the open tent. I will teach my children that a single symbol cannot erase the faith in their hearts or centuries of history. Irrationally believing that something so small could tumble the sacred history of our Jewish ancestors discounts the power and value of the religion. 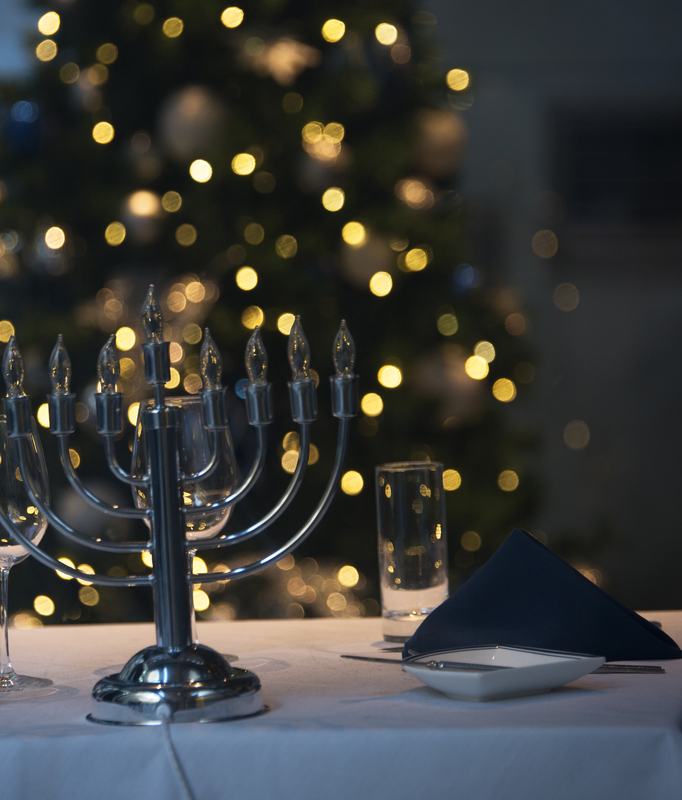 The unique beliefs and values that Judaism brings to the world are not watered down or erased by the presence of a tree in my home. If our people have been resilient enough to withstand the rise and fall of Greece, the destruction of two Temples, the Spanish expulsion, and the genocide of Nazism, then we are strong enough the convey our values while adding the meaningful traditions of other faiths into our practices. Wisdom is not lost by opening our doors to the outside.